A pioneering world first robotics system operation was conducted at Glenfield Hospital Leicester last week thanks to expertise at the University of Leicester and UniversityHospitals of Leicester. Manufactured by Catheter Robotics Inc. in the USA, Macclesfield based Dot Medical Ltd. has been appointed distributor and clinical support for the Robot in the UK and in Europe. Dr André Ng, Senior Lecturer in Cardiovascular Sciences at the University of Leicester and Consultant Cardiologist and Electrophysiologist, GlenfieldHospital, UniversityHospitals of Leicester, was the first person in the world to carry out the operation remotely on patients using this system. He used the Catheter Robotics Remote Catheter Manipulation System, named the Amigo, for the first time in a heart rhythm treatment procedure. The system is novel because it allows a doctor to carry out a common heart treatment procedure remotely using a robotic arm. Dr Ng said: "The new Robotic procedure is an important step forward because, while some procedures are straightforward, others can take several hours. Because X-rays are used to allow the doctor to monitor what is going on inside the patient, it means that doctors standing close to the patient wear radiation shields such as lead aprons which are burdensome. Protracted procedures can lead to clinician fatigue and high cumulative radiation exposure"
"The benefit of the Robotics system to the patient is that movement of the catheter can be done with great precision. It is anticipated that further developments of the system may allow complex procedures to be made more streamlined. On the other hand, benefits to the doctor are that heavy lead aprons would not be necessary as they will be controlling the movements of the catheter using the Remote Controller at a distance from the patient outside the radiation area. They can also be sitting closer to the monitors displaying electrical signals and x-ray images as opposed to standing at some distance across the room from them which is current practice." 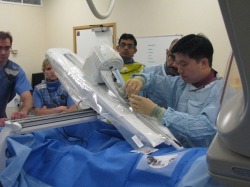 Dr Ng and his team's international standing and leading position in the management of heart rhythm disorders are reflected in the invitation to be the first to apply this new Robotics System in clinical procedures which also affirms the world-class research and pioneering work at the University of Leicester. Dr. Ian Rankin, Managing Director of Dot Medical, said, "We are delighted to have been directly involved with the Worlds first use of the Robotic Arm and in supporting Dr. Ng in its use. The Robot allows the Cardiologist to work in a much safer environment, away from harmful radiation and increase the precision of these heart operations. 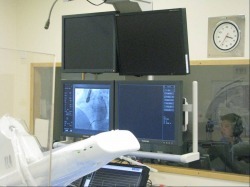 We believe that the Robot offers a major step towards health and safety in the cardiac catheter lab. " An NHS patient yesterday became the first in the world to undergo heart surgery performed by doctors using a robotic arm. A BRITISH surgery team used a robot arm in a world-first heart operation yesterday. A heart expert shows how he used a robot arm to perform the first op of its kind – on a patient in a different room. Doctors have carried out a life-saving heart procedure using the most sophisticated robot developed so far. A British pensioner yesterday became the world's first patient to have heart surgery using a fully remote-controlled robotic arm. A doctor is to carry out a heart operation with the help of a robotic arm for the first time ever. The arm will be used for a heart rhythm treatment. Britain is leading the world in heart surgery after using a robotic arm for the first time to “short circuit” a patient's heart. The first remote heart operation using a robotic arm was carried out on Wednesday at Glenfield hospital in Leicester. Doctors at a British hospital have carried out the first heart rhythm operation using a robotic arm. Heart surgery using a remote-controlled robot has been carried out for the first time by surgeons at the University of Leicester. A robot 'arm' has been used to remotely perform a heart operation in a world first for British surgeons. Normally the surgeon conducting the operation stands by the patient's bed shielded from the X-rays by a heavy lead apron. The robot permits the conduct of the operation remotely from a separate room. The first remote heart operation using a robotic arm was carried out on Wednesday at Glenfield hospital. Story about the robotic arm used in a heart operation by Dr Ng at Glenfield, aired at lunch and due on evening news. Surgeon Dr André Ng may look like he is playing a computer game – but in fact he is carrying out a complex heart operation. News that doctors at GlenfieldHospital have become the first in the world to use a robotic arm to carry out complex heart surgery is a remarkable coup for the city and our local health service. It is not the first time that Glenfield has been used to pioneer heart surgery and it is recognition of the extraordinary work carried out at the hospital. It is also a tribute to the calibre of the consultants who work in our city - on this occasion, Dr Andre Ng. The heart operation using the robotic arm has received much more international coverage, including news outlets in Italy, Spain, Hungary, Denmark and theCzechRepublic.